Welcome to the website of Dixie Lee Chan, children's book writer and tax preparer. A strange combination I know, but it works. I have recently finished a middle grade novel, 'A Horse Like Stormy' and am working on my first picture book. It helps that I live in a magical place called the Wandering Star Ranch located in Northern California. It's a horse farm where we breed, train, sell, and love horses. Meet Piccolo Pete, star of my upcoming picture book. Adorable isn't he? But Pete is more than just a very handsome flower loving pot-bellied pig. He has a special way with solving problems that gets him into way too much trouble with the other farm animals. Check back here to find out more. I've worn numerous hats in my life ranging from giving presentations at the Pentagon on multi-million dollar weapon systems to becoming an expert on artifical insemination. I spend my days now on my true passion: writing. Here in our 100+ year-old farmhouse, I sit at my desk and write. I can look outside the window and see newborn foals annoying their moms, chickens scratching up my just-sprouted carrots, and endless chores beckoning. My stories come from life experiences, history, and many from whatever happens when I walk out my kitchen door! Here's Harley napping in the sun with his mom, the famous Coco, looking over him. On the right is Bouquet, she's always looking for something to boss the other horses about. That's beautiful Allie above with her frisky foal Icy London. 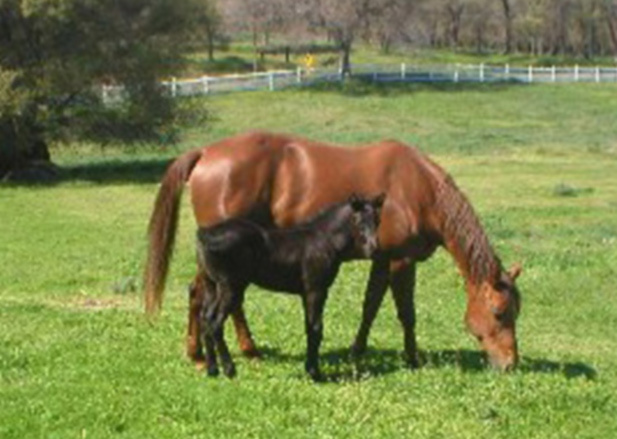 The foals here spend their days outside with their moms enjoying the sun and our lush green pastures. And here I am, a happy young grandmother with Savannah. Today we're visiting Fairy Tale Town in Sacramento, California. 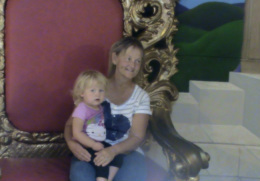 I love sitting on giant chairs where I get to tell tall tales about piglets and horses and .....elephants. That's because my little sister is a famous elephant trainer. She got her start years ago right across the street from Fairy Tale Town at the Sacramento Zoo caring for the Zoo's two elephants, Susie and Winkie. They're gone now, and my sister travels throughout the country helping elephants in zoos, but they will be featured in one of my future books! Here's two-year old Savannah with her diaper and binky learning to groom and care for her miniture horse Smokey. They have fun going for long walks together with Grandma and the adventures we encounter are always exciting!